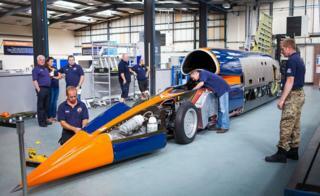 The Bloodhound supersonic car will run for the first time on 26 October. It is going to conduct a series of "slow speed" trials on the runway at Newquay airport in Cornwall. Engineers want to shake down the vehicle's systems before heading out to South Africa next year to try to break the land speed record. This stands at 763mph (1,228km/h), and Bloodhound's aim is to raise the mark in two stages - by getting first to 800mph and then to 1,000mph. The Newquay trials will not see anything like those speeds. The 9,000ft-long (2,744m) runway at the former RAF base is simply too short to allow Bloodhound to use the full thrust at its disposal. Instead, driver Andy Green will take the car up to about 200mph using just its Eurofighter-Typhoon jet engine. The rocket motor that would ordinarily provide additional power will not even be in the car as its development has yet to be completed. Nonetheless, engineers see the Newquay event as an important opportunity to gain some key early data on a rolling Bloodhound. "It will be a big emotional moment for the team," said chief engineer Mark Chapman. "We've gone from a computer design to an actual thing that will move down the runway. It will be a huge validation for the people who've stood by us all these years; it is happening. And, yes, it will also be a great shop window as we look to attract a bit more money to get us over the last few hurdles." Thursday 26 October will be restricted to the media, VIPs, sponsors, and members of the Bloodhound 1K Club. But the following Saturday will then see a public day of running, with an education day scheduled for the Monday. In between all this publicity activity, Mark Chapman's team will be trying to understand how the air enters the jet intake at slow speed and what that means for managing the power unit's performance. It will also be the first chance to assess all of the electronics built into the car. "Newquay will demonstrate that the cockpit talks to the rest of the car, and the rest of the car talks to the cockpit - and the whole thing then talks to the outside world." And that includes feeding high-definition video from the more than 10 cameras that will be embedded around the vehicle's bodywork. It will be a critical day too for driver Andy Green, because it will be his first experience of the steering feel, throttle and brake action, noise and vibration - things that cannot be truly simulated in a computer. The expectation is that Bloodhound will head to Hakskeen Pan - a dried-out lakebed in Northern Cape, South Africa - in just over a year's time to begin its assault on that initial 800mph target. For this to happen, the next phase of rocket development has to be concluded. The Norwegian aerospace company Nammo will supply the motor and has a basic unit available already. However, the Bloodhound team wants the thrust levels increased slightly, and that requires a period of testing. "We would hope to be starting this programme in the next two-to-three months," said Mr Chapman. "We're fairly confident that we'll have a rocket being tested within six months; and then the fully operational rocket will be within 12 months." October marks the 20th anniversary of Andy Green setting the existing land speed record in a car called Thrust SSC. Two other key figures from that effort in the American Black Rock Desert have returned to work on Bloodhound: Richard Noble, the director of the project; and Ron Ayers, the aerodynamicist.